The pressure booster pumps need to be sized to maintain the design pressure while experiencing the maximum expected flow at the lowest suction pressure to the pump. A pressure control valve is used to balance the system and maintain the desired pressure in the system as the flow rate decreases or suction pressure varies to avoid over pressurization and control problems. 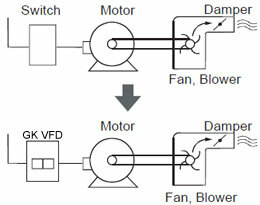 In instances where the flow requirements vary significantly, multiple pumps are placed in parallel. As water consumption changes, additional pumps are staged on or off to maintain the pressure. The location of the pressure sensor is important. In the relatively small pressure booster pumping systems found in commercial buildings, it is important to place the pressure sensor at the furthest possible location. When the variable frequency drive booster pump system becomes too large for one sensor, multiple sensors can be used, each placed in a critical area of the system. Where this is not possible, different set points can be established depending on the number of pumps operating.